I am drawn to beautiful mirrors. This one was calling out to me. I started snapping pics with my iPhone…notice my very serious shopping face. and ask her a zillion questions . . . she is so very kind and patient with me! Lidy told me that the style was Louis XVI. I put the mirror on a “hold status” and came back the very next day to claim my prize! Old? … take a look a the back of this beauty. the place of honor in which it will go. I fear the domino effect is going to take place. And . . . did you notice a new piece on the bedside table? It is a Juliska pitcher. to see if I was seeing correctly!…..I have swooned over that Juliska pattern! It is waiting to be filled with pretties and placed somewhere that I can see it often! Now you probably are wondering about the other “antique treasure” . . .
and definitely a treasure!! My mom! she went through this surgery because she was a good candidate . . . she is very healthy. She is doing wonderfully and thanks to everyone who have asked about her recovery. She is not quite 6 weeks post op . . . walking with assistance (sometimes) with a cane . . .
no walker for her anymore and hopefully the cane will be placed in a closet soon! Have a beautiful day and stay tuned for a great new and exciting Floral Friday!!! That mirror is a stunner and I know you will find it’s place of honor if not this house the new one! I’m so thrilled that your mom is doing so well. She is a very young 93!! Wow, Shirley, on BOTH your treasures! Your mom is an incredible inspiration. That mirror though…..♥♥! And the pitcher, too – wow. Juliska at HG. 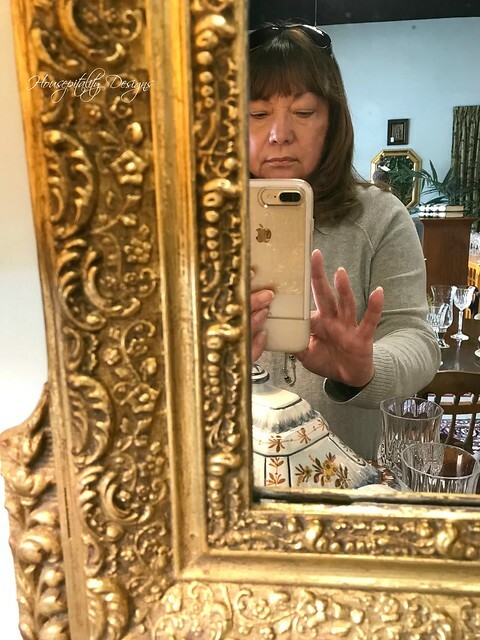 Shirley, what a gorgeous mirror! I saw when you posted it on Instagram…what a find! I also can’t believe you found that Juliska pitcher at Homegoods. I have always admired that pattern in both the blue and red. At Christmas time, in a local gift shop, they had the red punch bowl. I almost passed out when I saw the price. I would be scared to use it-lol! I’m so happy that you Mother is doing great after her surgery. I know that she is such s blessing to you. Take care, and enjoy your day!!! That is a beautiful mirror! 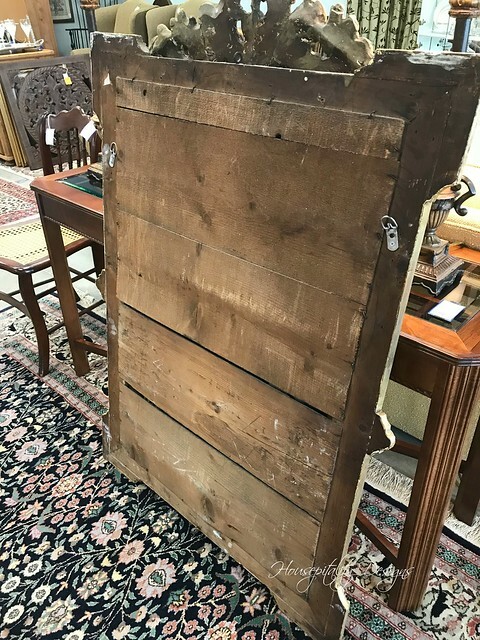 I am looking for a nice mirror too and hopefully I will be lucky to find exactly what I need. Your mother is just to precious! Enjoy both! The mirror really is a stunner! Great eye, I’m so excited for you that you got it. I’m so thrilled that your mom is doing so well, she is such a trooper. I hope to be as peppy at her age as she is, she is such an inspiration. It’s really her beautiful attitude that sets her apart. I hope you enjoy your time together. Love your choices and also the love you show for your mom. The mirror is so pretty and it’s an antique. I can’t see any damage on the frame. How blessed you are. Hope your new house will still be near enough to Always Home for you to visit it often. The mirror is gorgeous and what a treasure it truly is. I can’t wait to see where it ends up. Your other treasure is like a China doll. She must be amazing and I’m so glad to hear her surgery went well. Love on her good while you have her. I loved the mirror at the first look on Instagram! To find a Juliska piece at Home Goods is unbelievable, my closest one is 60 miles away. Your mom is an amazing and inspiring lady with the most beautiful smile. Enjoy your time with her. Great find on that mirror! I love for the backs to be original on mirrors and pictures. I need to go back to that store….have not been since I bought pillow. I don’t think about this store until you mention. Your mother is really a sweet treasure. She looks so happy! Have a blessed day! What a great find, Shirley! I can’t wait to see the place of honor this beautiful mirror will claim. That is a great picture of your Mom doing her rehab! She is a special lady, indeed. Have fun while you are visiting her. Hi Shirley, first let me say how great your mom looks after knee surgery, especially considering her age. May God grant her continued progress in her recovery. Now you know I have a passion for beautiful mirrors, it’s so gorgeous!!! Your mom is definitely a treasure Shirley…and how great that she is doing well after her surgery. 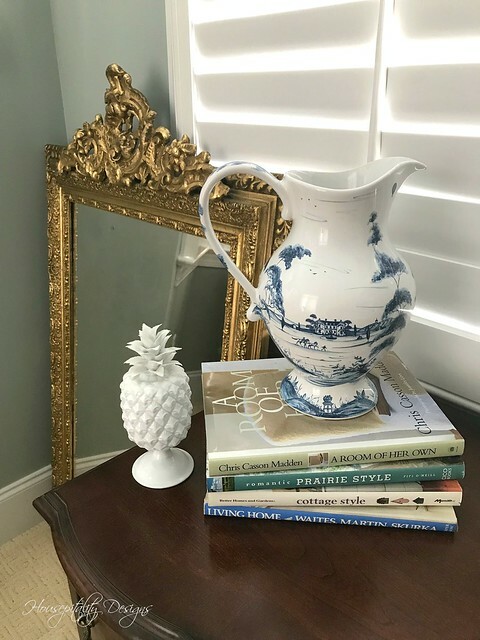 What a beautiful find your mirror is and your Juliska pitcher makes me want to dash out to HomeGoods! Mary’s recent post…DIY St. Patrick’s Day Centerpiece: Blooming and Edible Leprechaun Hat! 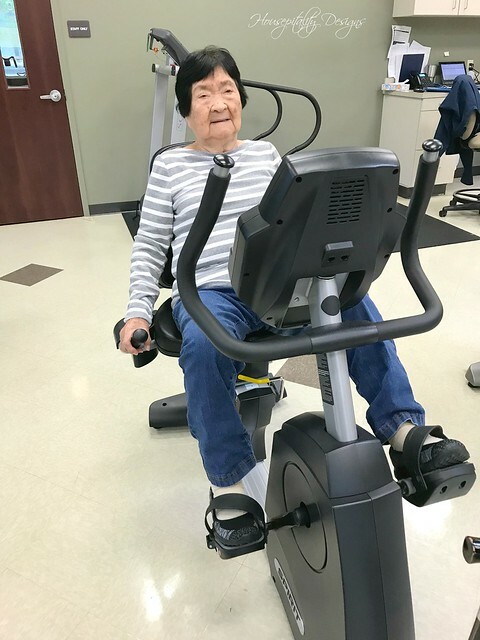 Shirley I am so happy God has Blessed you with precious moments with your mother; she is adorable on her bike at 93 yrs. young. I lost my mother when I was only 32 yr. old, I still miss her and it has been 36 yrs. So happy to hear your mother is doing well! Beautiful mirror! I, too, love that Juliska pattern. Love the good news about your mom. My mother fell a few weeks ago. Worst injuries are to her face/skull. She is in rehab now. She’s very weak. She is 89. If your mom can recover so well, I know my can too. 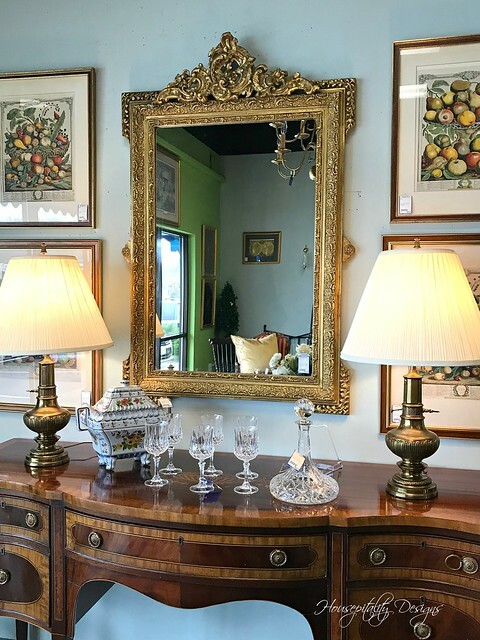 That’s a beautiful mirror- great find! Your mom is inspiration to us all! Liz’s recent post…Happy Birthday Sis! Your mom is a wonder! Glad to hear she is doing so well. Love your new finds, Shirley. I absolutely must stop in that shop the next time we’re on our way to my son’s home in Charlotte. Hugs! Oh my goodness, that mirror!! It’s beautiful and makes that corner look pretty just being propped there. The pitcher was such a great find too. You just never know what you’ll find at HomeGoods…right? I’m so glad your mom is doing well. Does she know she sets a great example for all of us? Stacey’s recent post…Hello Sunshine! Hello Spring! Tell your Mom to slow her roll…She’s putting me to shame!!!!! Wow! She’s doing grea5 for 6 weeks post-op! Glad to see her taking that recumbent bicycle on like a champ!!! Go, Mom!!! As for your treasures…gimme!!! That mirror is “da bomb”!!! So ornate and obviously well cared for over the years. Everything Juliska is gorgeous, and you really got yourself a keeper in that pitcher! The lines of it are great, and I like the design. It’s not way over the top. Perfect! Congratulations on us8ng your discerning eye (and Lidy’s expertise!) to the fullest! It takes patience, for sure! Hi Shirley, I went to our favorite shop in Durham and it seems I missed you by a day. I was in there one Wednesday afternoon and had a ball. I bought a sweet little pitcher with butterflies on a it and a great small silver compote. Thanks so much for telling about this great little store. I have to go to Durham to get blood work tomorow and will have to go as a reward for my suffering. Ha.. Your mom is wonderful. I lost my mom a couple of years ago at the age of 88. I miss her everyday.